Between around two and four months old; baby starts getting themselves into a sort of routine. They still massively depend on you but they start becoming a little more independent. You may find they no longer need to sleep on you or they are amused by a toy (as long as you stay within touching distance). During this period, I found that the EASY method worked best for me to get things done around the house and to make sure I did enough activities with the baby. EASY stands for Eat, Activity, Sleep, You. 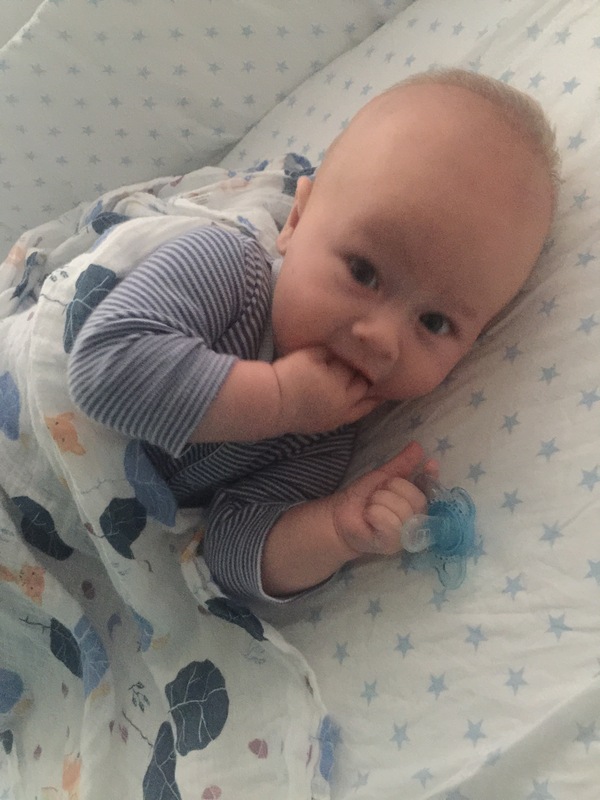 The routine goes something like this: the baby wakes up, you feed him (EAT), once he is full, you play with him (ACTIVITY), once he is worn out from this you put him down (SLEEP) and during this nap time you can focus on getting some jobs done/having a shower/eating (YOU). By the way for my article on establishing good naptimes click here. I noticed that from four months onwards, this routine can change again. 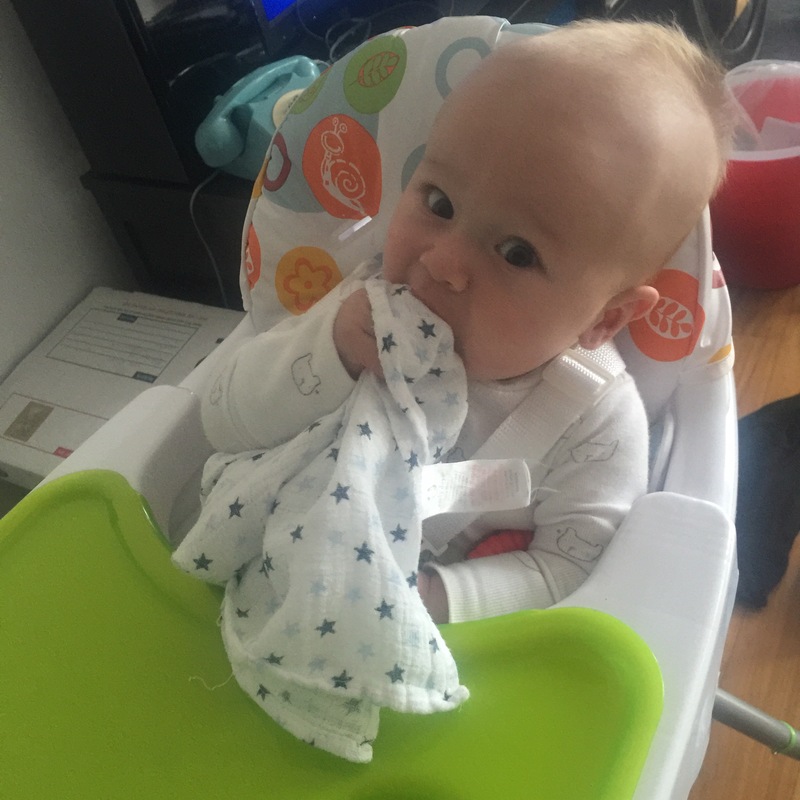 During the activity period, I can get my little jobs done because the baby can be left independently to play (I do not mean unsupervised) for example, I iron while baby is on his playmat in front of me or I pop him in his high chair while I sterilise his bottles. In this post I am going to talk about what my days look/looked like during each of these three periods in baby’s life. These periods are not set in stone by date and can be subject to change on a daily basis depending on leaps and growth spurts and I am by no means an expert, I only write about what I have seen from my own baby. 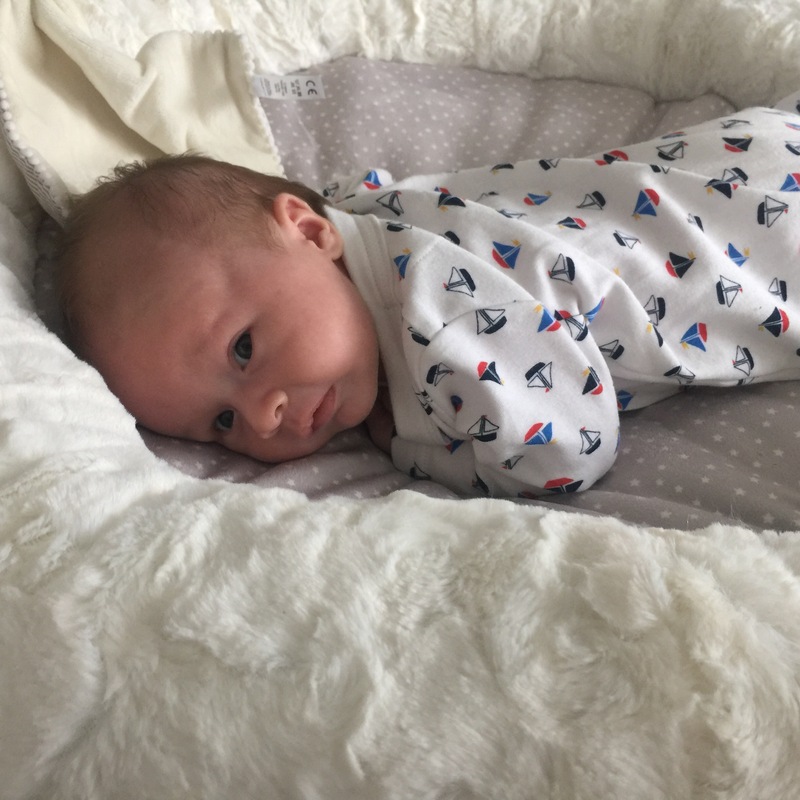 One thing mums (and dads) are asked time and time again is ‘is he sleeping through‘ or ‘have you got him in a routine?’ or my personal favourite ‘is he a good baby?’ (I don’t even know what this actually means, the first time I was asked his I said he was okay and was met with a look of absolute horror!) I hope this posts helps you to see that there is absolutely no rush to get your baby into a routine but also that it is so much easier to live your life around the baby as opposed to expecting your newborn to adapt to your lifestyle. I so often hear new mums complaining that they can’t get XYZ done. I truly understand it because I have been there and felt the stress/frustration/anger/tears when things didn’t go to plan, so I had to change tack. The washing would be done when I got a spare five minutes, I would text my friend and let her know that I was ready to meet NOW instead of planning a set time (baby poops/screams/naps when you have to leave the house by a certain time and yes, good friends will allow you to do this! ), I would have a bath when my husband was able to take over…. this does not last forever and to be completely honest, when you are that tired from being woken up twice a night, can you really be bothered to do your hair and make up? This isn’t the 1950s! We haven’t got to look perfect everyday and tea doesn’t need to be on the table every night. Let me know if you relate to the scenarios below, or were things totally different for you? 🗣Wake up at 6am, absolutely exhausted after being woken at 3am by baby for a feed. Baby had spent half an hour on the bottle before going straight back to sleep, I, however, could not sleep for a long time and lay in bed staring at the ceiling til gone 4am. Get up and make baby his bottle, he drinks half of it then wants to cuddle before finishing the rest. He falls asleep in my arms. I try to put him in his cot but as soon as I do he starts screaming. He only wants to settle in my arms. 9am comes and he wakes for another bottle. After feeding, I put him on his play mat for a while. I’ve placed it on the bed so I can lie here while he looks at his toys. Is he even looking at the toys? He falls asleep on the play mat and I am starving so I stack pillows around the bed incase he manages to roll and run to the kitchen to make some food, I have just opened the fridge door when I hear crying, I run back to find he is awake and crying. The only way to soothe him is to pick him up and rock him gently ’til he falls back to sleep. I don’t bother trying to put him in his cot. Midday comes and time for another bottle. I still haven’t washed, brushed my hair or eaten anything. I left the baby in his cot while I’ve come to make the bottle, he’s crying and crying but I need to quickly shove a biscuit in my mouth while this bottle is being made. After his bottle, I pop him in his pram while I quickly spray some deodorant and put on some clean clothes, then we go out round the block for a walk. By the time we come back it’s time for another bottle and I decide to give him a quick bath afterwards. He screams the whole way through, then, once he is dry, he falls asleep in my arms. My phone and the remote are not within reaching distance and I daren’t move in case I wake the baby. My husband finally comes home at 6pm and I slope off to the bathroom to have a shower. I stink. Somebody advised me to put my t-shirt in the cot so he would settle better in there smelling me but it just smells too bad. The baby doesn’t really have a bedtime at the moment because he wakes every three hours but we change him into a sleepysuit put him in his cot. He sleeps a lot better in his cot in the evenings but sometimes it’s a real battle to get him to sleep, he sometimes screams and screams, especially between 5pm and 8pm. Some nights, he screams until he is sweating, red in the face and real life tears appear. He can’t be soothed and me and my husband look at each other exsasperated. When this happens we walk up and down the block in he pram which sends him to sleep but as soon as we stop moving he’s awake again. He has another feed at 9pm and seems to settle in his cot after. We go into the kitchen and attempt to make some tea but end up ordering a takeaway. I fall asleep straight after eating it so my husband deals with the midnight feed which wakes me up anyway. Baby’s favourite activity: Lying on the play mat. 🗣Wake up at 7am to see my baby bright eyed and beaming back at me. It is so nice to wake up to a smiling face instead of an angry ball of cuteness screaming at me for his bottle. I head into the kitchen to make the bottle and have time to empty the dishwasher and make a quick brew before wandering back into the bedroom to feed him. After this feed, I put him back in his cot where he looks at his mobile and stares at me while I drink my cuppa and read my emails. He is back to sleep by 8.30am. I get up, get washed, dressed and put on my make up. I make a quick breakfast and do some odd jobs around the house like load the washing machine and match up odd socks. At 10am the baby wakes for his bottle which I have already prepared. After his feed we head into his nursery where, after getting dressed we practise tummy time. He can do around ten minutes now non stop on his belly and he tries several times to roll over, succeeding once. After a while, he starts getting upset at being on his tummy so I put him back on his back and give him a toy to play with. He seems occupied by the toy so I quickly pop to the loo which is across from his nursery but mid-wee he starts crying. I go back to soothe him and he soon calms down. I put him back in his cot by 11.15am for his second nap. It takes him a while to fall asleep and I have to go into the room several times to replace his dummy but by 11.30 he is fast asleep. I take this opportunity to do more jobs around the house all the while popping into the bedroom to check on him. He wakes again at 1pm for his feed which goes down quickly. I decide to take him out for a stroll along the waterfront. I put a few toys in his pram and a huge muslin which he loves to play with. After an hour of walking he looks very tired, he is rubbing his eyes and going crossed eyed so I take him back home just in time for him to fall asleep. While he is snoozing in his cot I make some lunch and eat it while watching the news. I wander into the bedroom a few times wondering when he will wake up. I’m bored and want to play, but I know better than to wake a sleeping baby. He wakes at 4pm and I feed him once more. We practise some more tummy time in front of the mirror and we walk around the flat together while I point different things out. Finally I lay him on his back and let him play with a foil blanket I got from Amazon. This awake period doesn’t last long and I can see him starting to glaze over. I put him back in his cot where he sleeps for 45 minutes waking back up at 5.30pm. Daddy is home from work now so he bathes the baby, puts his sleepy suit on and feeds him before bed. Meanwhile I get on with cooking tea and by 7pm we are both free to sit down and eat it while the baby sleeps. We will feed him once more at around 11pm and then he will sleep through til morning. Sometimes he will wake up in the night,but it’s rare these days. Some mums have stopped feeding their babies at 11pm but we are too scared to do that! 🗣Baby wakes up at 7am smiling and content. I go and make his bottle and return to find he has rolled on to his stomach and is pushed up looking around. I give him his 9oz bottle and he lets me put him back in his cot while I check my Facebook notifications. He happily lies there chatting away, occasionally rolling onto his front and back again. After an hour or so he starts to rub his eyes so I leave the room so he can sleep. I return after a few minutes to see he is fast asleep. I do a few jobs in the kitchen and put on the television to watch the news. After an hour or so I hear his moans and return to the bedroom where he is beaming back at me. He doesn’t cry when he wakes up anymore, it just sounds like he’s shouting out ‘Murrr murr!’ We go to the playroom and do some tummy time for an hour and read a book. Just before he is due to go back to sleep I give him his bottle, another 9 ouncer. I place him in his cot with his comforter, muslin and blanket and leave the room. I have to return once to replace his dummy but he then falls asleep. I set myself up in the couch to watch Greys Anatomy. At 1pm he is back awake so I bring him into the kitchen to sit in his high chair. I give him a rattle to play with while I empty and reload the dishwasher but he’d much rather watch me. We wander out for a little walk to town and after an hour and a half of being awake he falls to sleep. I make sure we are back home by 3pm in time for his next feed. 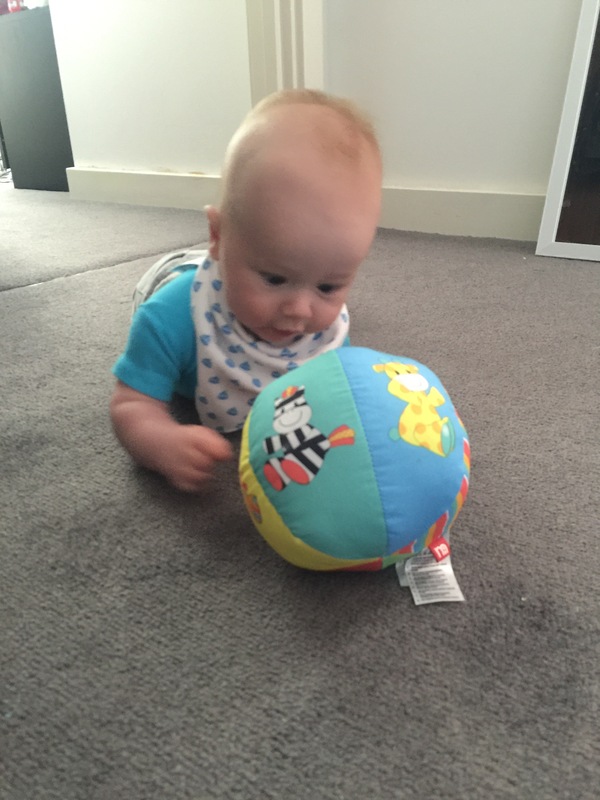 Once he’s drank it, I put him on his play mat while I do some ironing. He rolls onto his front and bats at the toys. Getting him down for another nap at 4.30 is quite difficult and I have to go in and out of the room several times but he is finally asleep by 5.15. Daddy comes home at 6 and baby naturally wakes up. We bathe him, read a story and give him a bottle by 6.45 and he falls to sleep holding Daddy’s hand while I’m in the kitchen making dinner. Most nights Daddy feeds the baby before he goes to bed at 11pm, we are still too scared to drop this feed because more often than not he downs the whole 9oz. Total sleep time: Baby- 16 hours Mum- 5 hours. Still waking regularly in the night to check baby is still breathing! 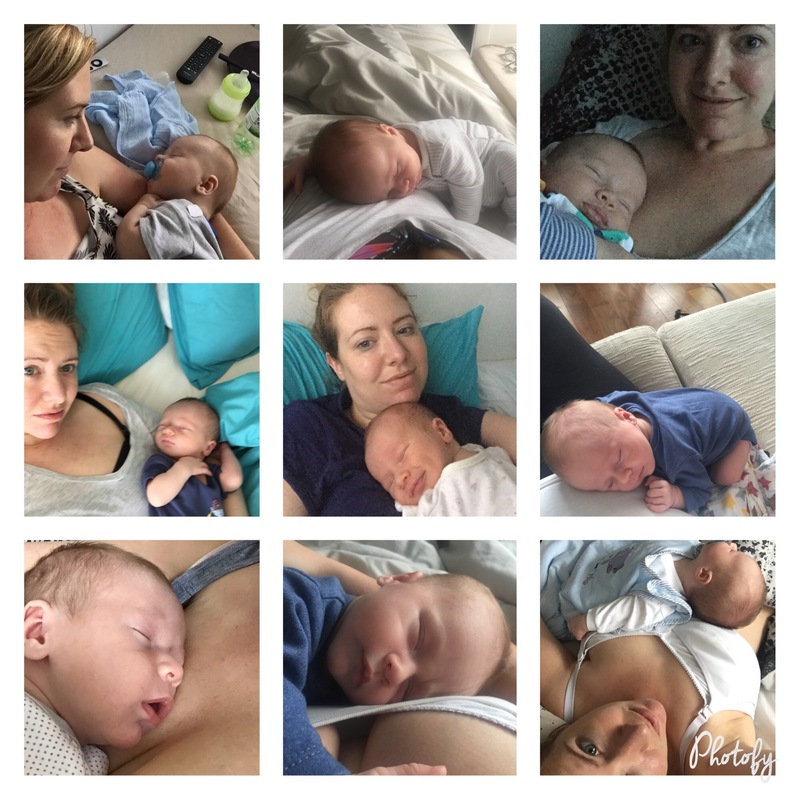 I was asked by another Mum on Instagram to share how I filled my days and I hope this post shows an accurate reflection of what days are like with a young baby. Days and weeks morph into one. Sometimes three hours feels like a day and sometimes it flashes by so quickly that you honestly can’t believe that the baby is hungry again already. If you don’t already go on Instagram, it’s an amazing way to meet new Mums and connect with like minded people.